ChessOK.com » Do Personality Types Determine the Type of Games We Play? To establish if personality types determine the games we play, I am going to use the Myers Briggs Cognitive Learning Styles model to assess whether there might be a link between personality traits and the types of games we play. 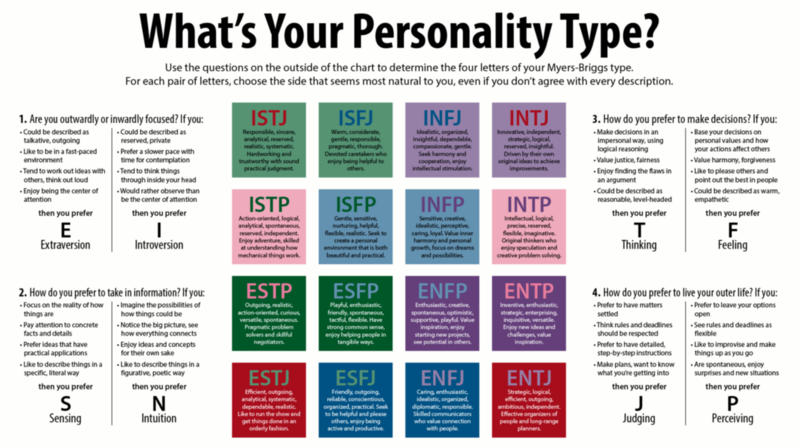 The Myers Briggs Type Indicator is a test based on Carl Yung’s book Psychology Types and is geared towards understanding how people perceive and interact with the world. The cognitive learning styles feature four continuums: Extraversion/Introversion, Sensing/intuition, Thinking/Feeling, and Judging/Perceiving. This article aims to see whether there is a connection between different personality traits, cognitive personality types and if they have an effect the games people choose to play. The different learning styles offer a valuable insight into the games people play and are more attracted to play, due to the ease of cognition and learning ability. It’s possible that people adopt games that they learn easily and are suited to their personality type. If you exhibit the characteristics of an extravert, you are more likely to learn by talking and communicating with other people. So basically, you are a more social animal and enjoy the interaction with others. This would suggest that in-person table games such as poker, blackjack, and roulette, that offer constant human interaction, would be suited to you. Introverted types enjoy the peace and quiet for reflection and internal exploration of ideas and thoughts and would be more suited to online gaming. The solitude of online gaming provides an introvert with the necessary environment they need to thrive in the decision-making process. The Sensing types like sequence, structure and format, which makes them naturally more attracted to games that contain these elements, such as multi-levelled card games that are a combination of luck and skill, that adhere to a rigid structure. An example of such a game is Texas Hold ’Em Poker that is more inclined to reward skilful players over straight out luck. Intuitive types prefer to roll the dice and follow their gut when it comes to the decision-making process. They like games that require timing and knowing when to place the big bets to get the best pay off. Intuitive people are more likely to play games such as Blackjack or slots; games where a player is relying more on luck than skill. They like to follow a hunch and throw down on a gut feeling or sign from the universe. Thinking types are more inclined to make decisions based on logic and statistics. They are less likely to play games that are based on random luck such as slot machines and prefer the strategy involved in tables games where statistics can be applied to enhance their chance of winning. Feeling types are more likely to throw down on slot machines and hope for a free reward such as free spins or wild cards. They like to take a chance and make the game a personal matter of winning and losing, whereas thinking types see the game as a separate puzzle to analyze and solve. Judging types like an organised structure and would be more suited to tournaments or long form games that have finite outcomes. They prefer the feeling of closure and the thrill of the game such as winning a tournament of Texas Hold ‘Em Poker. Perceiving types thrive in flexible environments where they can get on and off the game train at will. They have no problem if the game doesn’t arrive to a closing point. This makes them open to playing more casino style games in which the games keep on going as long as you keep playing. They don’t care for designated starting times and structures. They would more than likely prefer to play games such as blackjack, roulette and slots; games that don’t require commitment. It’s definitely possible that personality types and cognitive learning styles play a role in the choice of games people gravitate towards. The four continuums of cognitive learning styles under Myers Briggs offer some insight in to which games certain character types would prefer to play. Extraverts like to get amongst it and enjoy the social interactions of the games, whereas Introverts would prefer to be in the comfort of their own home playing the same game. It’s not to say the Extrovert would have more fun playing with other people than the Introvert would have playing online. It’s that different gaming conditions, as well as different games, could well attract different personality types. Sensing types like structure whereas Intuitive types like to ride the wave on a positive gut feeling. Thinking types prefer the ability to calculate odds, employ strategy and are separated from the game, whereas Feeling types make the game a personal and take winning seriously, more likely to take risks and double down. Judging types make better decisions when faced with rules and structure, whereas Perceiving types like the freedom of games that can be played whenever and don’t have set limits or timeframes. In conclusion, cognitive learning styles and personality traits are an insight into the style of games people play. It’s not conclusive evidence, but more of an educated ballpark stereotype. Why don’t you analyse yourself using the cognitive learning styles vs the games you like to play?